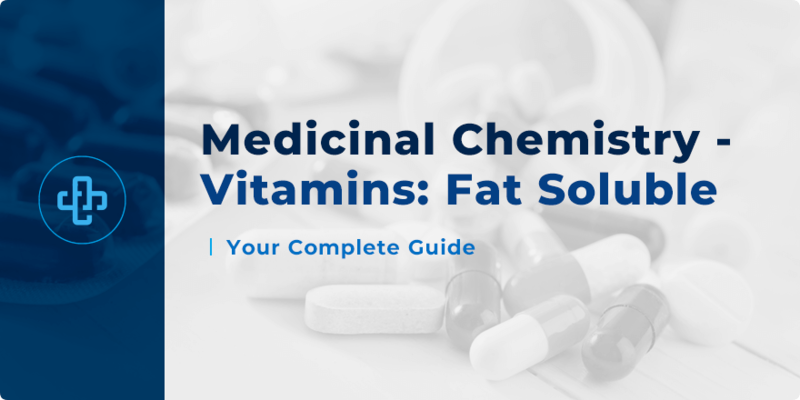 This section takes a detailed look at the medicinal chemistry of vitamins – this time focussing on fat-soluble vitamins. Vitamins are organic compounds required by an organism as vital nutrients in certain quantities in order to survive. These compounds have many roles. They are involved in biochemical processes such as metabolism and gene expression. Hypovitaminosis is the word used to describe any of the diseases associated with a deficiency of a certain vitamin. Hypervitaminosis refers to conditions that result from the intake of excessive amounts of a particular vitamin. Understanding the medicinal chemistry of vitamins will, therefore, have a marked effect on your understanding of pharmacology, particularly therapeutics where these drugs are widely employed. Vitamins are grouped according to biochemical activity rather than structure. Vitamins use an alphabetical naming system to describe groups of similar compounds through the use of generic descriptor titles. The term vitamer is used to describe similar compounds that possess a certain vitamin activity. For example, the compounds cholecalciferol (Vitamin D3) and ergocalciferol (Vitamin D2) are vitamers of Vitamin D. Similar to the usage of the prefix pro- in the pharmacology word prodrug, provitamins are substances that may undergo conversion to a vitamin in the body. Vitamins are classically categorised into fat-soluble vitamins and water soluble vitamins. This article only looks at the medicinal chemistry of vitamins from a fat-soluble perspective, beginning with Vitamin A. The compounds in this group are polyenes. In organic chemistry, the term polyene is used to describe polyunsaturated organic compounds that contain alternating double and single bonds. Vitamin A plays a role in numerous functions throughout the body which include the visual process, immune function, gene transcription, and skin health. Retinol, retinal, and retinoic acid are members of the Vitamin A group. Provitamin A carotenoids are also members of this group. β-carotene, the orange pigment found in carrots is a provitamin A carotenoid. In food items of animal origin, Vitamin A is mainly in the form of an ester such as retinyl palmitate. In the small intestines, retinyl palmitate is converted to retinol. Cod liver oil is a rich source of vitamins A and D. Other sources of Vitamin A of animal origin include livers of poultry animals and fish, eggs, and butter. Certain livers of animals such as the polar bear have really high concentrations of vitamin A.
β-carotene is responsible for the orange colouration of many different fruits and vegetables. Examples include mangoes, carrots, cantaloupes, apricots and yams. Some green leafy vegetables are also rich in β-carotene but the green colouration is masked by the green colouration of chlorophyll. β-carotene is generally absorbed by passive diffusion in the body. The compound is cleaved symmetrically at a central carbon-carbon double bond. This reaction requires molecular oxygen and is catalysed by the enzyme β-carotene 15,15 β-monooxygenase to give two retinal molecules. Retinoids is the term used to describe a class of compounds that are related to Vitamin A. Retinoid drugs are used to treat conditions like psoriasis and acne. Pure retinoids are typically coloured and appear as red, orange, or yellow. The conjugated double bonds of the compounds form the chromophore. Examples of retinoid drugs include adapalene, acitretin, and tazarotene. Due to the role vitamin A plays in visual phototransduction, vitamin A deficiency is associated with medical conditions related to the eye.The deficiency of vitamin A in the diet is known to cause nyctalopia (night blindness). Vitamin A deficiency is prevalent in some central African countries and some south-east Asian countries. Attempts such as the golden rice project are being made to solve the problem of vitamin A deficiency in certain countries where deficiency is common in the population (see further reading). Vitamin A deficiency is also known to impair the immune system’s ability to fight infections. Vitamin A deficiency can be treated by increasing the intake of vitamin A rich foods or through supplements. Vitamin A usually in the form of retinyl palmitate, is available in oral and injectible forms under many trade names (eg. Aquasol A ®). Hypervitaminosis A refers to a potentially fatal condition which occurs when toxic amounts of vitamin A are present in the body. Effects of excessive vitamin A in the body include irritability, headaches, desquamation, and photophobia. Hypervitaminosis A is generally treated by reducing Vitamin A intake. As you can see, from both a medicinal chemistry as well as a pharmacology perspective, Vitamin A plays a central role in therapeutics. Continuing our analysis of the medicinal chemistry of vitamins, we now turn to Vitamin D. As mentioned earlier, the secosteroids cholecalciferol (Vitamin D3) and ergocalciferol (Vitamin D2) are vitamers of Vitamin D. Without the subscript, the term vitamin D refers to either or both main vitamers. Both vitamers can be obtained through one’s diet or through supplements. Vitamin D is colloquially referred to as the ‘sunshine vitamin’. Humans are also able to biosynthesise cholecalciferol through the photolysis of 7-dehydrocholesterol by UV light in the skin. Cholecalciferol is hydroxylated in the liver to form calcidiol and then in the kidneys, to calcitriol. As the name suggests, calcitriol has three hydroxyl groups. Calcitriol is the hormonally active form of the vitamin. This compound interacts with the vitamin D receptor (VDR) which is a nuclear receptor. This ligand-receptor complex acts as a transcription factor. Calcitriol is involved in the regulation of the levels of Ca2+ and PO3- ions in the bloodstream. 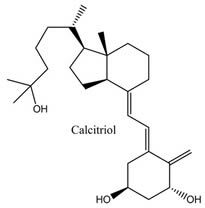 This hormone also induces the synthesis of proteins that are involved in calcification and bone remodelling. Fish liver oil is a good source of this vitamin. Other dietary sources of cholecalciferol include cow’s milk, butter, egg yolk, and fatty fish species such as catfish and tuna. 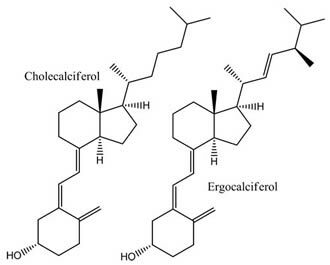 Certain species of mushrooms are decent sources of ergocalciferol. Food products such as soy milk can also be fortified. Hypovitaminosis D is a deficiency of vitamin D often resulting from low vitamin D in the diet inadequate exposure to sunlight, impaired ability to absorb vitamin D because of a certain disorder, or combinations thereof. Vitamin D deficiency results in poor mineralisation of the bone and as a consequence, bone-softening diseases such as osteomalacia in adults and rickets in children. Both cholecalciferol and ergocalciferol are used to treat known or suspected vitamin D deficiency. In some cases, calcitriol is used instead. Calcitriol is marketed under trade names such as Rocaltrol ® and Calcijex ®. Interestingly, hypervitaminosis D does not appear to arise from excessive exposure to sunlight. Pharmacology studies suggest that excessive amounts of vitamin D in the diet is known to result in conditions such as metastatic calcification of soft tissue and hypercalcemia. Hypervitaminosis D can also potentially lead to permanent damage to the renal system. Calcium salt deposition in the kidneys may occur. The Vitamin E group consists of eight vitamers. 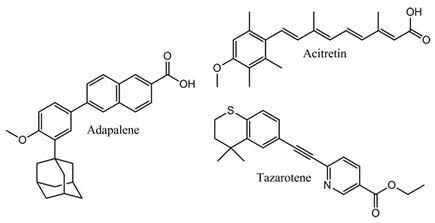 These are the α-, β-, γ-, and δ- tocopherols and tocotrienols. Germ oils of cereals are good sources of the vitamin. These fat-soluble compounds serve primarily as antioxidants. Due to their ability to dissolve in fats, they are often incorporated into cell membranes. These compounds serve as scavengers of reactive oxygen species which protect cell membranes from oxidative damage. In simplified terms, α-tocopherol protects cellular lipids by reacting with radicals, forming α-tocoquinone. Particularly in premature infants, vitamin E deficiency is known to result in a form of anaemia where erythrocytes rupture due to free radical damage. Deficiencies are also known thought to lead to neurological dysfunction. Phylloquinone (Vitamin K1) and menaquinones (vitamin K2) are natural Vitamin K vitamers. Vitamin K is involved in the post-translational modifications of proteins involved in blood coagulation. The post-translational modifications of these proteins allow the binding of calcium ions. Vitamin K deficiencies cause bleeding problems. Vegetables such as kale, broccoli, and spinach are good sources of Vitamin K1. Intestinal flora, particularly gram-positive bacteria are known sources of vitamin K. The overall contribution of these bacteria to the overall intake of the vitamin is currently unknown. This completes our analysis of the medicinal chemistry of vitamins; specifically the fat soluble variants. If you’d like to take a look at the water-soluble counterparts, please see here for further information. Vitamin E and its function in membranes. Prog. Lipid. Res. 1999, 38 (4), pp 309 – 336.